With the fabulous hot weather we’ve enjoyed this summer, I’ve come to rely on great salad suppers. Perfect for using leftovers and keeping the heat off in the kitchen. Here are a couple I’ve put together lately, along with the recipe for an interesting dressing. I don’t think you need a recipe for salad. Basically any green base (romaine, spinach, arugula etc. or a mixture), assorted raw veggies (peppers, mushrooms, tomatoes, cucumbers, carrots, zucchini, snap peas etc. ), possibly leftover cooked veggies (broccoli, carrots, beans, corn etc. ), and a protein (beef steak, pork, shrimp, chicken, eggs, tofu, bacon). Sometimes I’ll throw in some nuts (pecans, walnuts, pine nuts or almonds) and a smattering of crumbled goat cheese. I think most things improve with a little goat cheese. Almost forgot, sometimes I add a little fruit – fresh or dried, and sometimes the nuts are candied. When I candy nuts I do a bunch and keep them in the freezer for just such occasions. 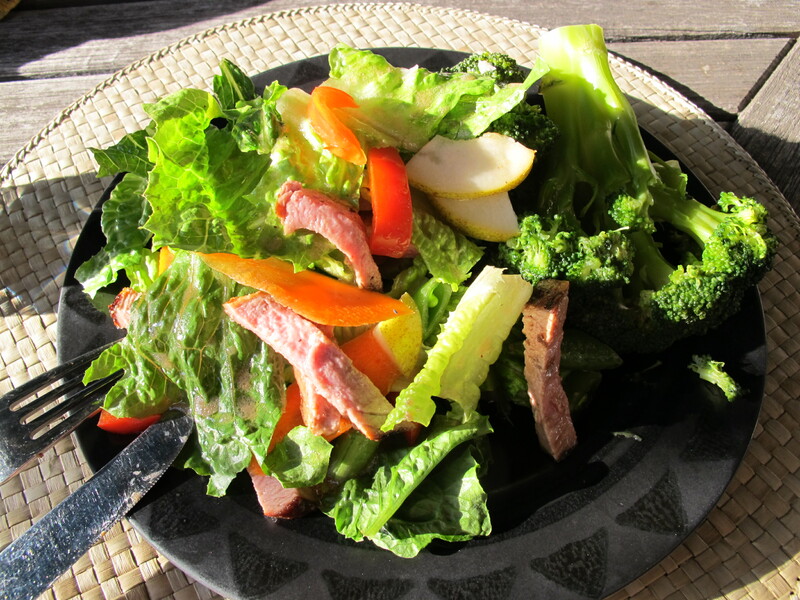 This first salad has romaine, red peppers, pear and barbecued pork tenderloin with broccoli on the side. That actually looks a bit boring to me, but I remember it being tasty. 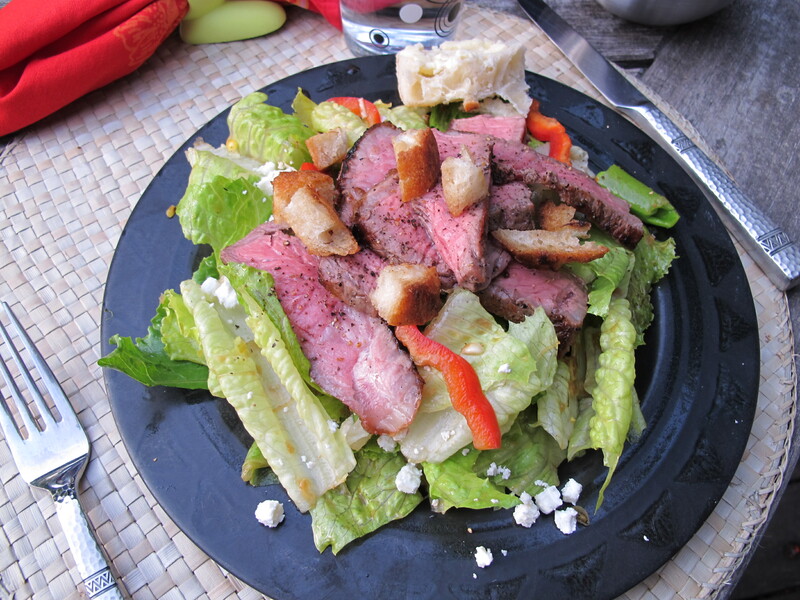 Doesn’t look like the dressing had been added at this point – a simple vinaigrette with olive oil, Dijon mustard, red wine vinegar, salt and pepper. This dressing recipe comes from the “Cooking Fresh” magazine by Fine Cooking . You can see the full recipe for Asian steak, watercress and spinach salad with hoisin vinaigrette here. I altered the recipe slightly since I wasn’t going shopping before dinner. We didn’t have any watercress or spinach in the house, and I refuse to use canned water chestnuts. I replaced half of the sesame oil with canola oil as I was afraid it would be too strong and thick. It was delicious. I love dinning on the deck. Calgary has short summers that must be taken advantage of! Don’t worry about it – we all have those moments – and more frequently than we’d like! If I can get someone to cook for me, I’ll come and cook for you! Thanks for following.